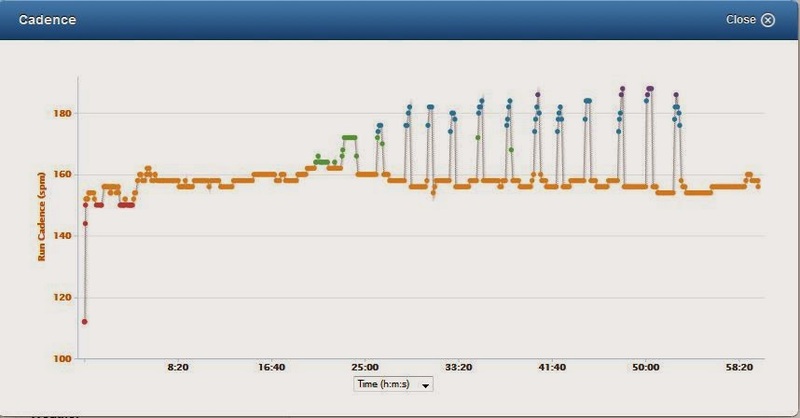 You can see that the pickups started right after the second mile. Interesting that, even with a spike, I was able to stay very close to my MAF heartrate after recovery. Where, oh where, are all of my runners? All of my friends who want to run on Saturday mornings. With a high of mid 60s forecast, I figured we’d be swamped at the shop for the morning run. Unfortunately, it’s 40 degrees, overcast and windy. I have to admit, normally I would have pushed off at 8am alone, but it’s cold, windy, and I’m tired. Sometimes you have to know when to wait. So off to the house I go, for another 90 minutes of sleep. Thank GOODNESS Laura understands!!! And BOOM, at 5:42 PM, it is BEAUTIFUL outside and 61. NOW is the time for the run. It’s great to take off and run in a tech t shirt and a pair of shorts. 90 minutes on tap and I’m determined to try and stay under my MAF number. The alarm is back on, so let the Bee Doo DOOOO commence. Nice!! But does that mean that I wasn’t really pushing myself in the middle there, if I was able to drop almost 20 seconds off my mile, and only go up 1 beat? Eureka!! Two guys showed up for an 8 am bike ride! 43 degrees with a windchill that makes it feel like 38. Brrr. Plus we’ll be creating our own wind when we take off on the bikes. Previous engagements limit the amount of time we can ride so we decide on an hour. Nice entry back in to cycling. Now the way I have my Garmin set for cycling, it takes a sample every 5 miles, instead of the every mile sample/split that it takes during running. I may change that up to make it more comparable to my runs but here are my EASY splits. They say, that because of gearing and the ability to change cadence and power easily on the bike, that it can be more difficult to make yourself get up to your MAF range. I’m going to try and make a concentrated effort to get up to that 143 mark, to make myself a stronger cyclist. I think I’ve found the answer to knowing if I am training at the right heartrate number. The entire next blog will be about that process, and the future of this training. I feel strong, like I can run forever, but I would like to know if I’m pushing myself or not. Check back SOON!!! Previous PostHoly Cow!!! !Next PostEmbrocation means tingling!!! !